It’s hot right now. 90 plus degrees and I am not a happy camper, I prefer cooler temperatures. I love the sun, but melting in it? Just not for me. So I found a rare shot of snow on the beach in Alki Seattle. It snows here rarely, but when it does, the beach becomes magical, lonely, beautiful. You can just imagine a whale surfacing take a quick look before disappearing into the sound again. 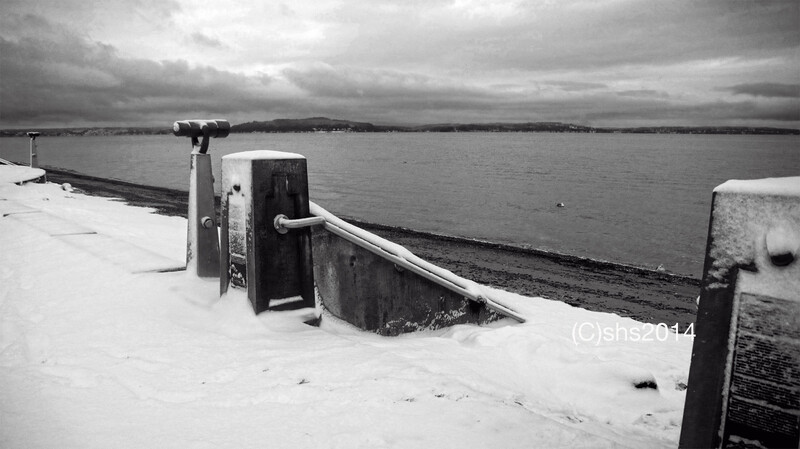 Black And white Number 23, Snow on Alki Beach. Gallery | This entry was posted in Black and White Photography Challenge, photography and tagged Alki Beach, Black and White photography, Black and white travel photography, Seattle, Seattle Beaches, Snow, Washington, Winter. Bookmark the permalink. I love this picture! I used to live down the street from where you took this photo. I’m looking forward to the cooler temperatures, too. Thanks Fannie! It’s amazing how the beach can change its mood! This day was perfect. Not a soul on the beach, just silence and snow! Just wow! Snow on a beach has always been an odd combination to me, Susan, for some reason. I prefer it cooler too… and I love that photo!